Jean Arless was one of the stage-names used by Joan Marshal. She made several film and Television appearances, and was the inspiration for the 1975 movie Shampoo written by her husband, director Hal Ashby. 10/09/1978 0903 The Triple Crown Convinced that he has discovered the next \"Seabiscuit,\" a poor stable hand purchases a horse with the intention of entering him in the high stakes races. He meets all sorts of characters along his journey to find investors in his venture. Joan Marshall (born Joan Schrepfermann; June 6, 1931 – June 28, 1992) was an American film and television actress. 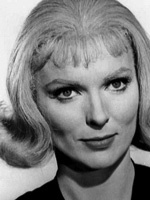 She is best known for her appearances in The Twilight Zone's "Dead Man's Shoes", and Star Trek's "Court Martial". After appearing as a dancer in the film The Chicago Kid (1945) and in a part in the television series Have Gun – Will Travel (1958), she moved to California around 1959. In 1959 she reprised the role of Sailor Duval in the short-lived television series Bold Venture. She also appeared in may TV shows including Highway Patrol,77 Sunset Strip, Gunsmoke, he Jack Benny Program,"The Outer Limits", Petticoat Junction, The Munsters and many others, During the 1960s, Marshall frequently guest-starred on various television series, including Tales of Wells Fargo, Surfside 6, Hawaiian Eye, and The Jack Benny Program. She also appeared in the films Homicidal (using the stage name "Jean Arless") and Tammy and the Doctor opposite Sandra Dee and Peter Fonda. She also appeared in Looking for Love,The Happiest Millionaire,The Horse in the Gray Flannel Suit as well as Shampoo.